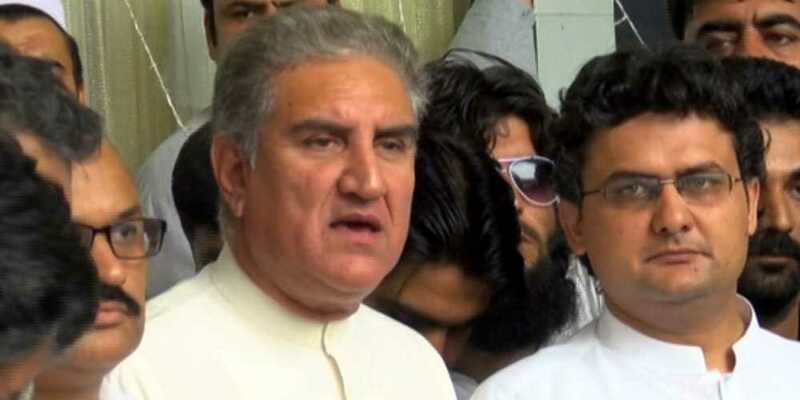 Pakistan Tehreek-e-Insaf (PTI) leader Shah Mehmood Qureshi on Monday said opposition parties have united against them owing to fear of the party. Addressing the media after the party’s parliamentary committee meeting at a private hotel in Islamabad, he said: "The Pakistan Muslim League-Nawaz (PML-N), Pakistan Peoples Party (PPP) and Muttahida Majlis-e-Amal (MMA) have come together owing to a fear of PTI." The PTI leader added that the party chairman Imran Khan believes the opposition is very weak. Qureshi claimed that the PTI has emerged as the largest party of Pakistan. "We are in a position to form the government in the centre," Qureshi asserted as he thanked independent MNAs-elect for their support. "PTI has representation in all provinces and the center," he maintained. Speaking about the PTI's parliamentary committee meeting, Qureshi said he had the honour to present a resolution on behalf of the party nominating Imran as their prime minister candidate. "Imran is the captain of our team and he apprised party parliamentarians of the challenges we will have to face in the coming days," he continued. "We now have to move forward together to resolve the nation's issues," he said. Qureshi also denied media reports that he will be nominated as the party's candidate for the post of National Assembly speaker. "No such decision was taken in the meeting," the PTI leader said.